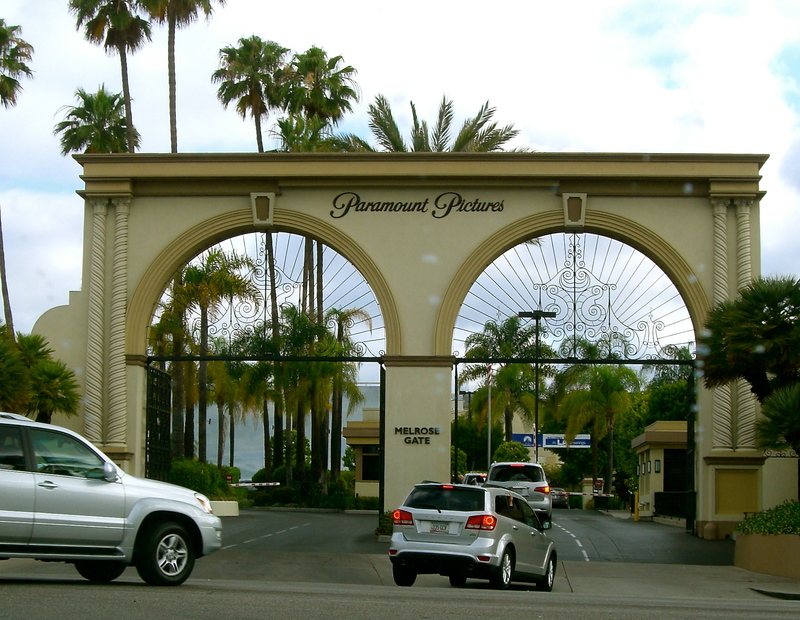 Got up at 5:30 to get on the road by 7:15; the 20 mile drive to Paramount took about an hour and twenty minutes. Thank heavens I had Clark to drive me; I can’t imagine arriving in a peaceful state of mind, after battling through that on my own. 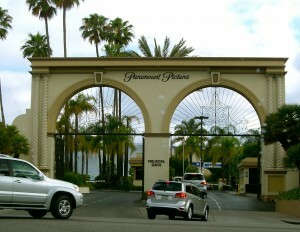 The Melrose Gate to Paramount Studios. Lovely sunny morning, although just chilly enough for a few goosebumps as we waited outside a café at Paramount for Kirk to fetch us. At a table behind us, we eavesdropped as someone told Tia Mowry (at least, I think it was her…) what a fabulous job she’d done on something, how professional she was, and how they very much wanted to work with her. Waiting at the cafe for Kirk. I didn’t drink the water until after; last thing I wanted was to have a pressing need for a restroom. Kirk fetched us, and we went to the animation department where Clark was deposited in a small waiting area with a coffee table covered with six big glass urns full of different types of candy – red licorice, Hershey kisses, those assorted mini candy bars you buy by the bag full for Halloween. Animated movie posters on the wall, and a book of Tin Tin movie art on a side table. The young creative executive I was to pitch to came out and got us, and we went into his office and sat on overstuffed, old, broken down living room chairs that you couldn’t give away for free on the curb. There were several minutes of chitchat – mostly between Kirk and Lucas about the age of the building – and then I did my pitch while Lucas took notes. So how’d it go? From my end, I think I did as good a job as I could have done. The practice run-throughs with Harry and Susan were a huge help, as was all the preparatory information from Kirk about what I should think about, and have answers to. Lucas smiled and laughed through most of it… But smiles are free. At the end, he said he’d “talk to some people” about it. But that doesn’t necessarily mean anything, either. (Can you tell I’m trying not to get my hopes up?) Kirk says he’ll try to get a real read from Lucas on what he thought of the story, and let me know. Whatever does or does not come of it, at least I know that I gave it my best shot. Kirk gave us a quick tour of the lot afterwards, and we had lunch together at the commissary – he was stealing time from between two meetings, so there was no time to go to the raw vegan restaurant he’d promised earlier. Aww, shoot. Kirk and I went to kindergarten together, not that either of us remember that. We became friends in junior high. Kindergarten — That’s Kirk on the far left, me on the far right. 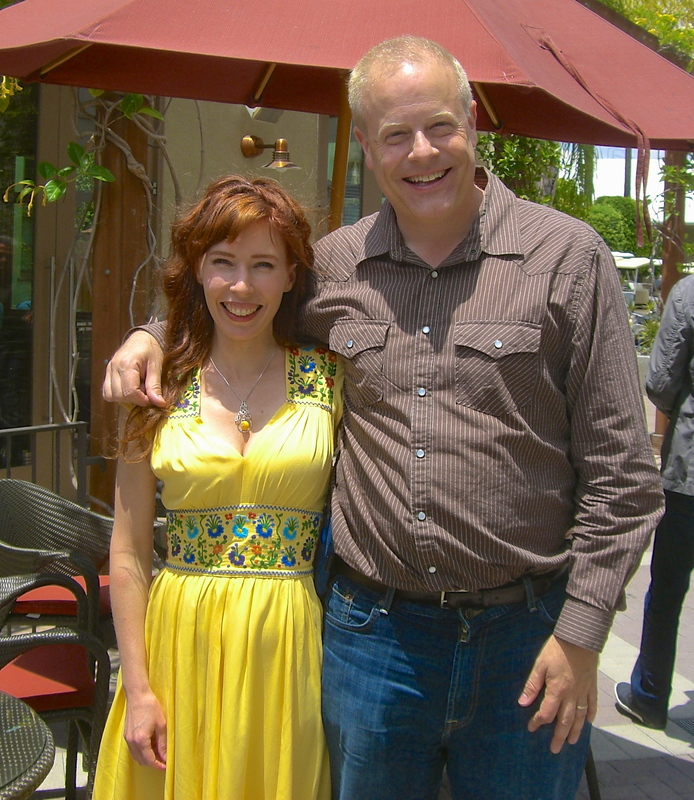 Goodbyes were said, and then we were off to see my agent, Helen, at a coffee shop a few blocks away. While waiting for a table, we listened to the girl behind us talk about the audition she’d gone to… The industry does seem to permeate the city. It seems like half the billboards in town are for movies or TV shows. Overheard conversations are all about auditions. Which reminds me — Fashion Report: Hollywood Edition. Knit maxi dresses with spaghetti straps; flip-flops; large dark aviator sunglasses; and highlighted blond hair pulled up in a high, slightly messy pony-bun (one of those ponytails where you don’t draw the hair all the way through the elastic the last time, leaving you with a loop of hair resembling a bun). If not that, then skinny jeans/leggings and undefined layers of knit tops in neutral colors. In all cases, a cell phone in the hand. 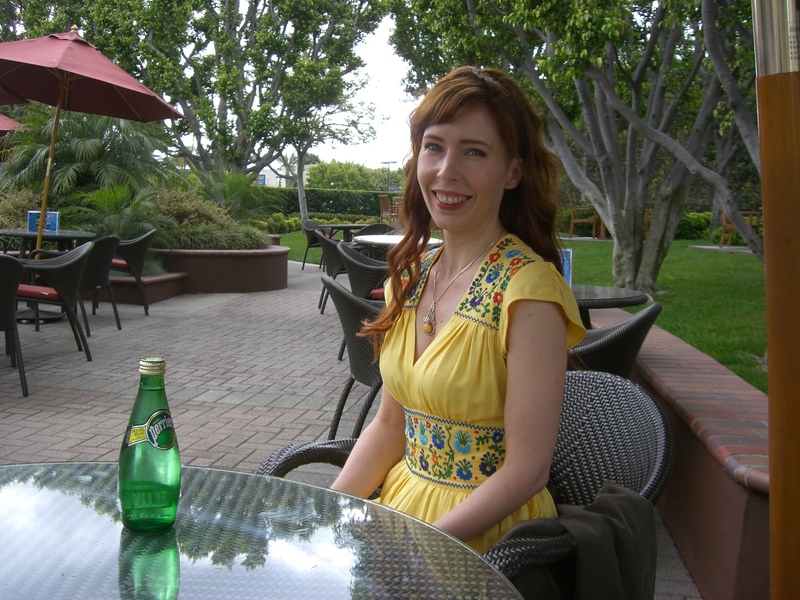 If you’re wondering about my yellow dress, it’s from Trashy Diva. The meeting with Helen was mostly to talk about Scrumpy, and she reiterated what she’s said before: that I need to write the whole manuscript before she shops it to publishers. They get too many completed manuscripts to be willing to look at partials, these days. I sang her my gross-out “Caye Caneen Song” – filled with references to the types of gunk animals like to eat – and she said, “You had me at ‘entrails.’” Like me, she feels there’s a nine-year-old boy inside her, snickering. She also gave me a new re-issue copy of “The Kid Stays in the Picture,” by Robert Evans – one of her clients. It’s about his days at Paramount, so she thought I’d be interested. Back on the road Clark and I went, heading ‘home’ to Redondo Beach. 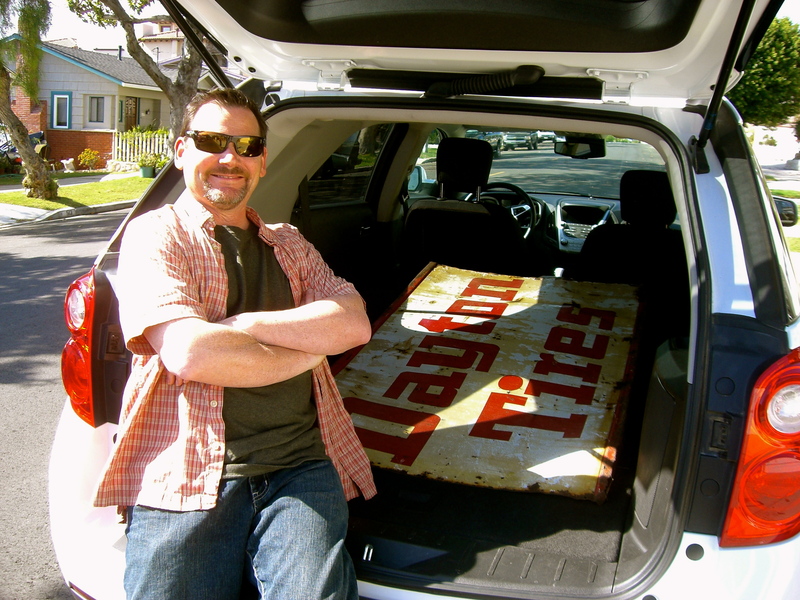 We got back early enough for Clark to zip back out to an antique shop for a Dayton Tires sign, which now graces the back of our rental, covered by a ratty old blanket donated by Harry and Susan. Clark with his Dayton Tires sign, which barely fit in the rental car. Cocktails are being prepared for the nightly viewing of the sunset from the upstairs balcony, and then Susan will finish making a cherry pie while Harry gets our beef Wellington dinner going. We feel like vacation can really begin now: Clark’s site visit for the conference is over, and I’ve done my pitch. Time now to relax and enjoy the trip.